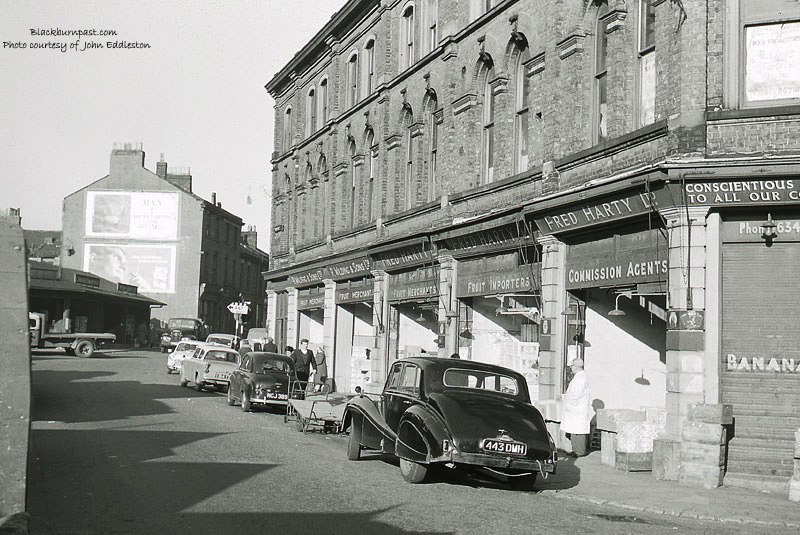 A section of Victoria St, where the premises were mainly occupied by wholesalers. On the extreme right of the photo is Fred Harty's place. Fred was the father of the now deceased TV presenter Russell Harty, who as a schoolboy worked with his father at times, so no doubt knew these premises well. The Harty property was on the corner of Cort St, which led down to Ainsworth St. In the distance, where the lorry is, are more wholesale units and then some properties on the opposite side of Victoria St. Facing those wholesale units, just out of sight around that corner to the right, was the County Courts, which of course is still with us today. So where that pole is, with the road sign atop it is, is approximately where the exit from the shopping precinct (the one near the toilets) now is. Where those properties on the other side of Victoria St are, with the large signs on the gable, is where that very tall lamp, with the fountain below it is today.